–what things can help get the premium cheaper than this? Typically the private flood market and Lloyds of London flood Insurance is much less than the Federal program the NFIP sometimes 50% less. However, as you have seen in your state there are few private flood insurance option (Superior Flood being one) but they have pulled out or scaled back. We have many private flood Insurance options and many Lloyds of London flood Insurance options nationwide and we shop all options for any given property. Kentucky is a tricky state for private flood insurance and I think that this is because the tax code for KY is not standard with the rest of the country, because of this I haven’t seen many private flood insurance options brave enough to enter KY (YET). I do expect them to soon. That being said the only option I am seeing is the NFIP option and that is what is driving the premium for the option we found you. I do have some ideas – because I am a flood Nerd and want to help. It was good to speak with you. Here are the options we discussed. 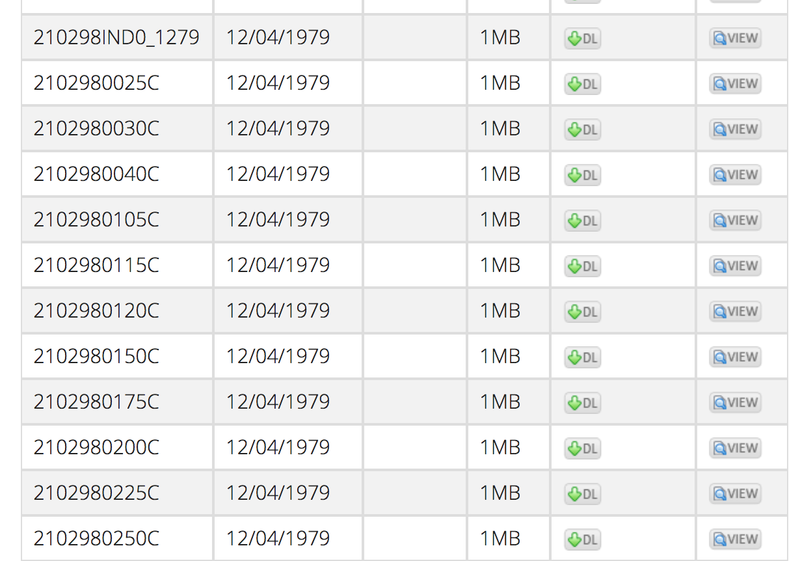 I adjusted the option to $77,000 of building coverage only (no contents coverage). If we get an Elevation certificate (EC) that show the property as higher then the BFE then our premium could be $529. 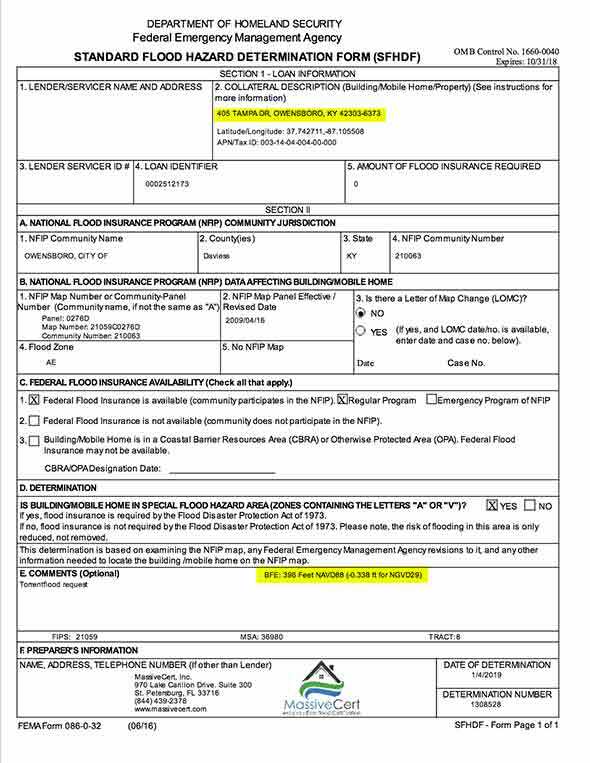 Attached (PDF and photo below) is an official flood zone Determination (FZD) that show that the BFE (how high the waters will go according to the Core of Engineers) is 396 ft.
and I am seeing the elevation of the home is at 397ft this is about a foot above the BFE and might be worth it to get an EC. Again this site isn’t exact so there is a slim chance that the home might be sitting lower but as long as it isn’t 3ft under the BFE then we will get a favorable rate then not rating with an EC. If you choose to get an Elevation Certificate. 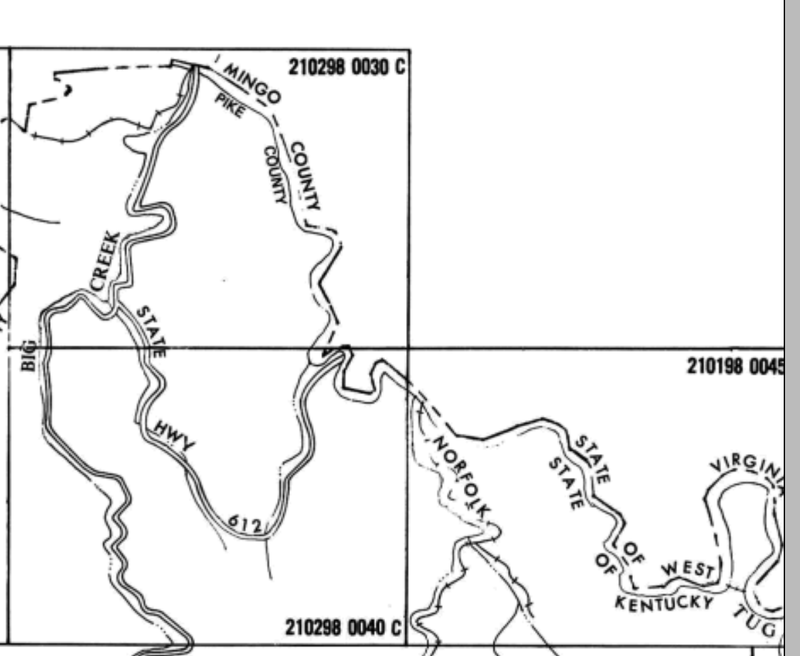 I have a surveyor I think really knows what they are doing in KY.
Tell him the flood Nerd sent you. Again if you choose to work with us our intent is to shop this policy next year on the Private flood insurance market. Hi Pamela thanks for reaching out, Sorry we didn’t get to you on Friday. let’s try to align on Monday. You can call the office 1-866-990-7482. I have three ideas I want to discuss. 1) you can get a surveyor out to give you an Elevation certificate. I can order it for you or you can google search for your area and elevation certificate. If I order for you I am seeing the cost of $749. I do think an Elevation Certificate would help your property with the rating. But want to see if we can get ideas on the rating. If you have a smartphone go to your lower area and ask it if Apple (hey seri what is my elevation) if Google (Hey Alexia,…). or just type into your phone what is my current elevation. The Base Flood Elevation is 780.1 ft this is how high the core of engineers believe the water will rise I am hoping your foundation is no less than 2ft below this number or ideally higher. Then an Elevation Certificate would benefit you. Another option is to look at historical maps. This link should take you right to your areas maps. Look at historical maps 12/04/1979 reason we are looking for this particular date is that the Flood zone determination (FZD) says this is when the community first entered the government program. 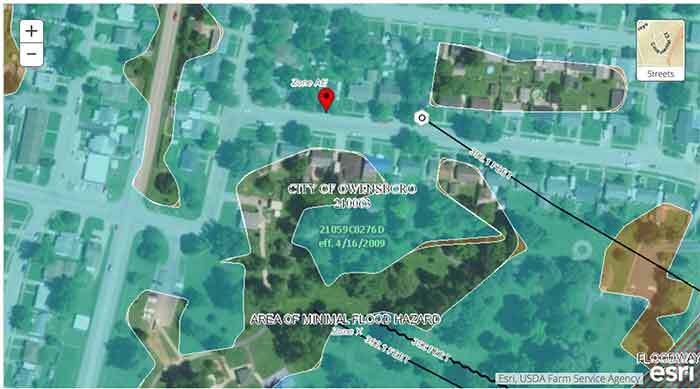 WHAT we are trying to do by looking at these maps is find a map that shows that the area where your home (or structure) is was not in a high-risk flood zone at the time of construction, your building was built in 1980 so it is right on the line. If we can find that the area is not in the flood zone then we might be able to grandfather for built-in compliance at the time of construction. This could save us on premium though grandfathering the flood zone. Try looking at these particular map numbers, I am hoping you can navigate the maps much better than I since I am not as familiar with the area. And find the map where you structure is. Once you locate your home let me know the map and I will see if we can grandfather the flood zone. The goal here is to take the lowest flood out of the “flood insurance rating” and these vents will allow us to do that. Since you primarily live over lowest flood and use the lowest flood to do something for your business this might work. You will need to work with your local floodplain manager as well as the installer to do this correctly and then you will need to get an Elevation Certificat to “qualify” for the discount. I hope these get you going in the right direction and I hope we can get a better premium.